Microsoft recently launched a program to entice more developers to make Windows apps by paying them for all apps published from March 8 to June 30. 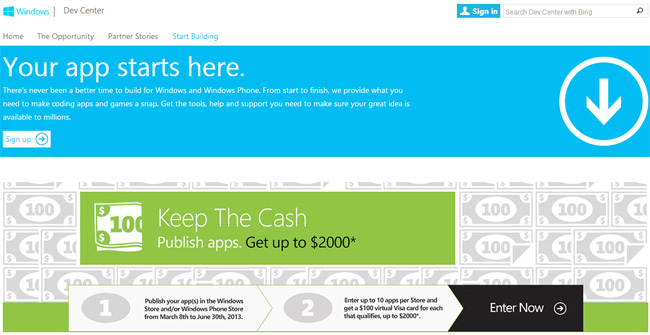 With the program in place, you get can $100 per Windows 8 app. Developers can submit 10 apps to each the Windows Store and Windows Phone Store, meaning it’s possible to get $2,000 in total by submitting 20 apps. You can’t whip up a quickie product and expect to automatically make $100 for it, though. Developers need to fill out a form on the promo page with links to all the apps they want Microsoft to consider and then hope that the submission qualifies for the promo. If it does qualify, the developer will get a $100 Visa card for each app, and he or she can keep submitting more apps until they hit the $1,000 ceiling for each store. Compensation is limited to the first 10,000 qualifying entries, all of which should do more than just launch a browser to open a website. According to stats published in December 2012, there are more than 35,000 apps in the Windows 8 Store. Unfortunately, many of them are filler apps that either don’t work as intended, or don’t work at all. The promo period is short, so unless Microsoft closely scrutinizes each app it deems qualified to receive $100, its stores could end up with even more shovelware. Let’s just hope the company’s people do what they can to find the true gems among the junk, or at least the diamonds in the rough. We’ll have to see if this strategy will give us even more reason to think the Windows 8 store is a complete mess, or will it finally do some much needed good? Germany's iconic (and deadly) Nurburgring racetrack can be yours for $165 million. Any takers?